We're downstairs in the dark marble bar. Dilusha orders cast iron seared fish of the day, striped bass, and it's on grilled bread with heaps of greens. Her salad is slathered with onions and oranges, pickled something, and peppy green aioli. She is nuts about it. 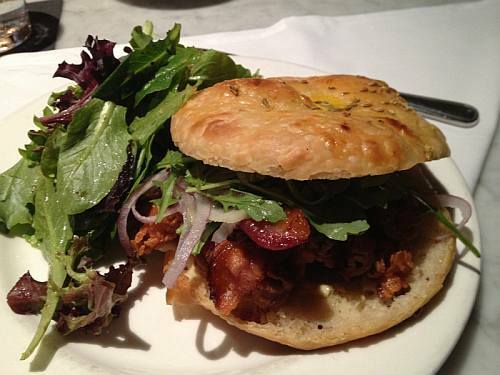 Mine is a fried clam roll, very crispy it turns out, with arugula, bacon and a salad of pickled fennel, greens and onions. This is not your usual clam roll; it's so good we eat it with the roll and we never eat the roll. Another day, another lunch, it's March madness and Restaurant Week. Today's menu is for hungry eaters: parsnip soup; lamb shank; plus a chocolate strawberry snowball with truffle cake, mousse and marshmallow all for $13. I'm at the upstairs bar with a busy, genial bartender who tells me they specialize in New England on tap. Yes, with a Cambridge crowd so not shy about big cocktails for lunch. He's busier than the shucker. On the way in I met the Island Creek guy, double-parked in Harvard Square, rolling a dolly. Right now they're showing Virginia Misty Points along with Island Creeks from Duxbury. I stop him so I can inhale summer, ocean and mud all bagged up. 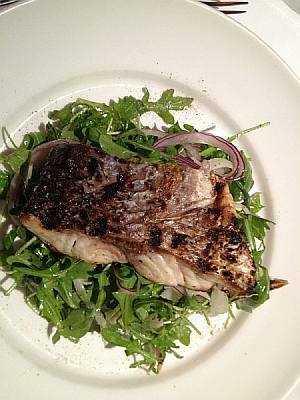 He urges me to have some but I order snapper with a salty, lemony outside, piled on toast with salad and onions. It's lunch, no cocktails, but we don't want to go. Dilusha says "dessert." 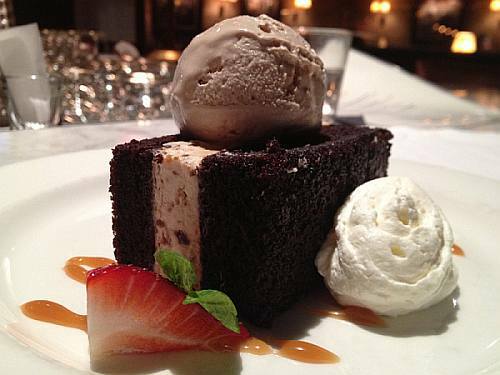 Look what she orders: This is gianduja ice cream from hazelnuts, chocolate cake, strawberries, fig and honey mousse and whipped cream. It's the best eight bucks we spend. (Yes, it's the same photo on my Facebook.) When you're shopping, schooling or librarying, and if it ever gets warm, we'll see you on the patio to give the Island Creeks a shot.